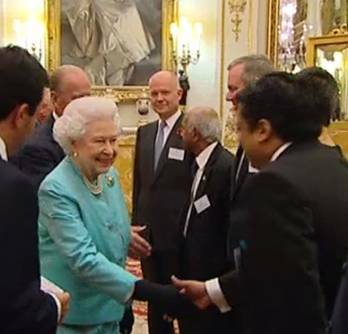 Her Majesty the Queen hosted a reception at Buckingham Palace for the London based Commonwealth High Commissioners, all of whom sit on the Board of Governors of the Commonwealth Secretariat, ahead of the Commonwealth Heads of Government Meeting (CHOGM 2013) in Sri Lanka, the event was also attended by HE Kamalesh Sharma, Commonwealth Secretary-General; the Rt Hon William Hague MP, Foreign Secretary; the Rt Hon Hugo Swire MP, Minister of State for the FCO. The Queen was accompanied by HRH the Duke of Edinburgh, and TRH the Duchess of Cornwall and Prince Charles, who will represent the Queen at this year-â„¢s CHOGM. Bravo! NOW the GOSL can REDUCE Indian political, economic and military involvement in Sri Lanka, REVOKE the 13th Amendment, and DISMANTLE the Provincial Council System. Lets us GET OUT OF India’s DEADLY SUFFOCATING EMBRACE … NOW! Also, Mr. Kurshid and the rest of the Indian delegation should stay at home in India as well … They are missing Man Mohan Singh’s Party with the Tamil Nadu Racists! Nov 09, New Delhi: India’s External Affairs Minister Salman Khurshid will lead the Indian delegation at the Commonwealth Heads of Government Meeting (CHOGM) to be held in Sri Lanka next week, Indian media reported today. Indian media reports quoting government sources said the Prime Minister Manmohan Singh has decided to skip the event in the light of the strong opposition within his own Congress party as well as from the Tamil political parties in Tamil Nadu. The PM’s decision to skip the event will be conveyed to the Sri Lankan government tomorrow, sources said. “The Prime Minister is likely to write to Sri Lankan President Mahinda Rajapaksa by tomorrow regarding his decision,” India’s PTI news agency said quoting government sources. However, there Indian government or the Congress party has not made an official announcement on the Prime Minister’s decision yet. The Prime Minister and the Congress Party core group headed by party president Sonia Gandhi had deliberated the pros and cons of PM’s participation in the summit for over an hour yesterday but the discussions had not produced any conclusive result. Some sections of the Indian government were of the view that non-participation by Indian PM yielding into the political pressure from Tamil parties would result in India losing the leverage it has on Sri Lanka and drive the island nation’s government more towards China and Pakistan. CHOGM is is a meeting for the heads of government and if the heads of governments can not attend for no valid reason, then those delegations should be given a back seats.Friends of our enemies like Sing and Harper should be treated as our enemies. They are not only treating Sri Lanka with contempt, but their own people as they represent a small minority,the Tamil tigers, not India or Canada. This entry was posted on Saturday, November 9th, 2013. You can follow any responses to this entry through the RSS 2.0 feed. You can skip to the end and leave a response.